If you are considering the String Project, or if you or your child will be starting lessons on a string instrument, you will find it helpful to be somewhat familiar with your various options. For children, simply physically managing a full-sized instrument can be difficult and frustrating. Fortunately, all of the string instruments are available in various small sizes that are proportional to child-sized bodies. 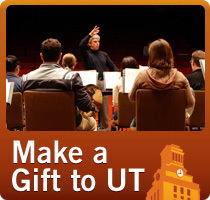 The String Project has a limited library of sized and full-sized instruments available for rental to our students, and many music stores in the area also rent sized instruments. Choosing an appropriately sized instrument is very important, since practicing on an instrument that is too large can lead the student to cope by developing physical habits and postures that are, in the end, both detrimental and very hard to change. The violin is the highest pitched of the string instruments. Violins and violas look very much alike, and both instruments sit on your shoulder while you play them. Like all string instruments, violins are very versatile, but they are maybe most commonly seen in classical music, fiddling, and mariachi music. More kids choose to play the violin than any other instrument in String Project. It can be nice to have many friends who also play your instrument, but sometimes it can be hard to be in such a big crowd. The viola looks a lot like the violin, and like the violin, it sits on your shoulder. However, a viola has a deeper, lower sound. This instrument has a long history and a beautiful sound. Many composers have chosen to play viola when playing their own pieces. The American Viola Society and many groups like it sponsor competitions, publish magazines, and commission new compositions all centered on violas. Because not many people know about the viola, violists are constantly in demand, not only in the String Project, but also in other educational groups and in the professional world. Just listen to the sample and hear how great a viola sounds! Right: A student with a cello her size. The cello is also a popular instrument with our students in the String Project. Many students prefer the cello to the violin because of its deeper, lower sound. Cellists play the lowest, root parts in string quartets, providing an anchor in a chamber music group. In string orchestras, only the bass plays lower parts than the cello. The cello is so big that players place it between their legs when playing; an end pin, or metal rod, keeps it at the right height. Unlike a violin or viola, a cellist places the bow across the strings level with the floor. Some famous cellists include Yo Yo Ma and Pablo Casals. Right: A student playing an appropriately sized bass. The bass is the lowest of the string instruments, and the root of the orchestra. A full-sized bass is so large that not many adults play them; most play a three-quarters sized instrument instead, including many professional symphony members. The bass is unique among the orchestral strings in that it is a member of the viol, not violin, family of instruments. A bass is also sometimes called a string bass, upright bass, or double bass. Bass players are not only in demand in the world of classical music. 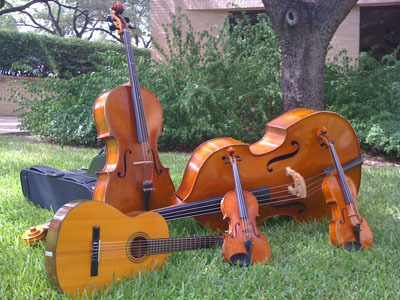 Many styles of music include a bass at the root of their ensembles, including jazz, salsa, country, folk, and pop music among others. Unlike the other string instruments, bass players choose between two styles of bows. A French bow is a shorter, thicker version of the bow used by the other string instruments; a German bow has a different style of frog, and the player uses this frog to hold the bow differently. 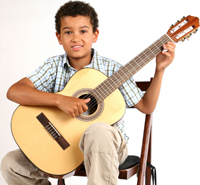 Right: A student with his guitar. Most Classical Guitars have six strings. One of the neatest things about classical guitar, and something that sets it apart form other string instruments, is that you can play both melody and accompaniment at the same time! The instrument is plucked with the fingers of the right hand – professionals and advanced students even use their fingernails. Music for the classical guitar ranges from hundreds of years ago all the way to the the present day and even though many people think of the guitar as being a Spanish instrument, music for the guitar comes from all over the world. Guitarists play solo (all by themselves) but also with other instruments and voices and, sometimes, even with symphony orchestras. Top to bottom: A violin bow, viola bow, cello bow, and two bass bows (French style and German style). Almost everyone who has seen a string instrument has seen a bow, too, but not as many people have heard of them. The bow is the stick players rub on the instrument’s strings to produce sound. Some string instruments, like guitars and harps, make sound when the player plucks strings without a bow. The orchestral string instruments can do this, too, but they were designed to be played with a bow and most of the time they use one, although the bass employs the pizzicato style, or plucking, more than the other strings. A bow is a carefully crafted piece of wood with the tail hair of a horse stretched between the ends. (Some bows designed for beginning students use synthetic materials instead.) Because the bow is what makes an orchestral string instrument produce sound, learning to use your bow is at least as important as learning what to do with the instrument itself.